I wore this outfit the other day for work and there was a lot of traffic on the way home so my husband and I stopped by this wall to take some pictures. 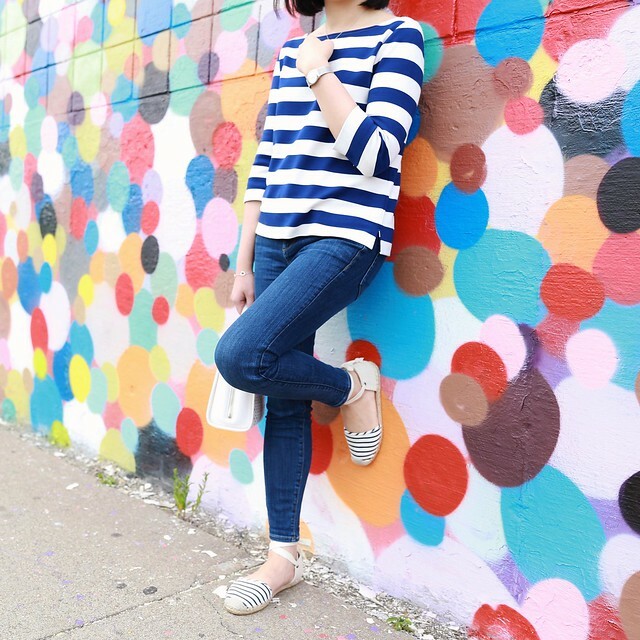 I really liked how this shoot turned out since this polka dot wall (located on Lincoln Street in Boston, MA) pops with my stripe top. 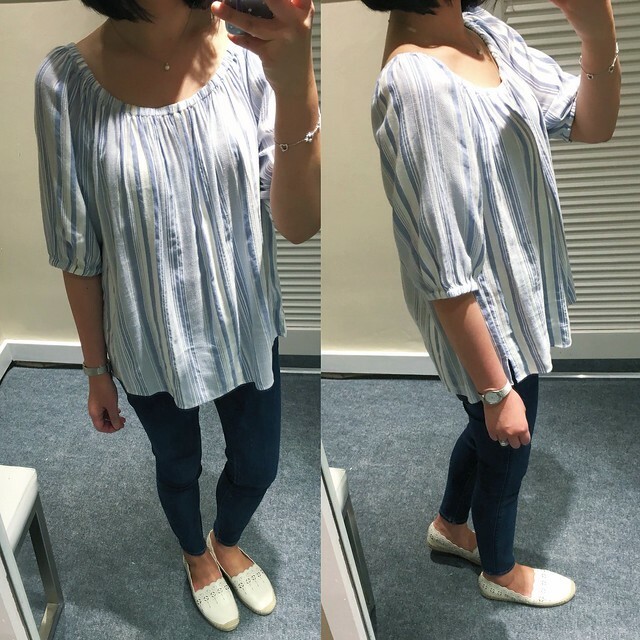 I ended up getting the stripe boatneck top in size SP which is still a loose fit on me. I wish I could have tried on the regular missy sizes for comparison since I usually prefer the extra overall length but I haven’t seen the regular missy version in stores yet. I’d say this top fits true to size but I went up a size so that it would be more loose and comfortable. 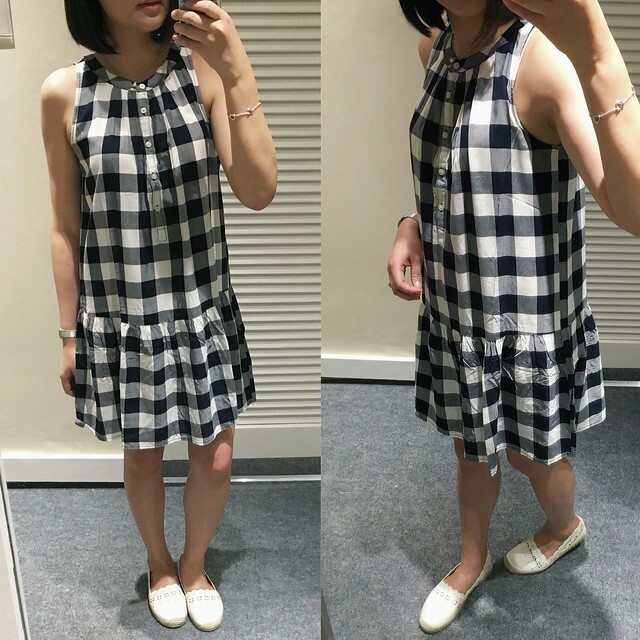 I wanted this gingham drop waist dress but I wasn’t sure which size to get in this print. Luckily I came across size XXSP and XSP in stores today. See size XXSP on me here. 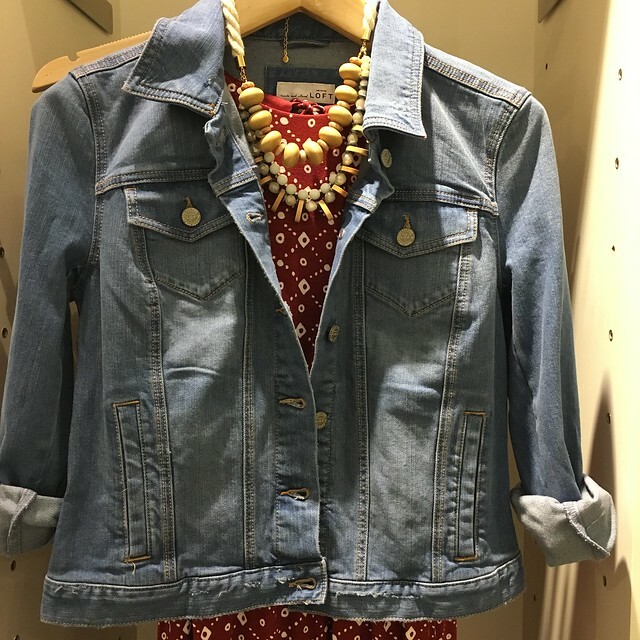 It fits exactly like the chambray drop waist dress that I reviewed in this post. It is a loose fit in my usual size XSP but size XXSP is a bit too short for my preference. 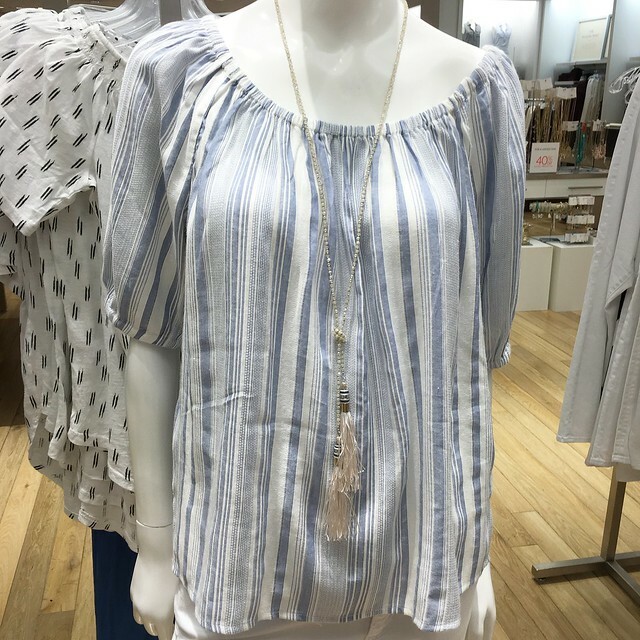 This striped off the shoulder top caught my attention since it was on display front and center at the store. I tried on size S regular since it was the smallest size on the racks but then I noticed that the mannequin had size XS on. 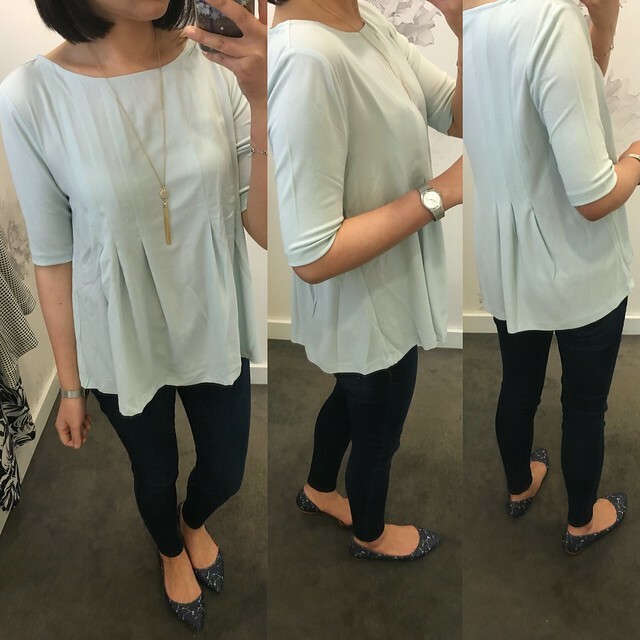 It’s a loose, flattering fit and I love the color combination (the true color is shown below). It’s meant to be worn off the shoulders but it actually works as a regular top and it provided adequate coverage over my bra straps. I’d say it runs one size bigger but I would prefer size XS so that the sleeve length fits like half sleeves. You can see the denim jacket in mid vintage wash on me in this post. I wanted this matte jersey pleated top when I spotted it online and I tried on size S regular which was very roomy on me. I liked how the sleeves weren’t too tight. I also tried it on in XS regular but I forgot to take pictures of it. I’d say this top fits true to size but it’s definitely a boxy fit. 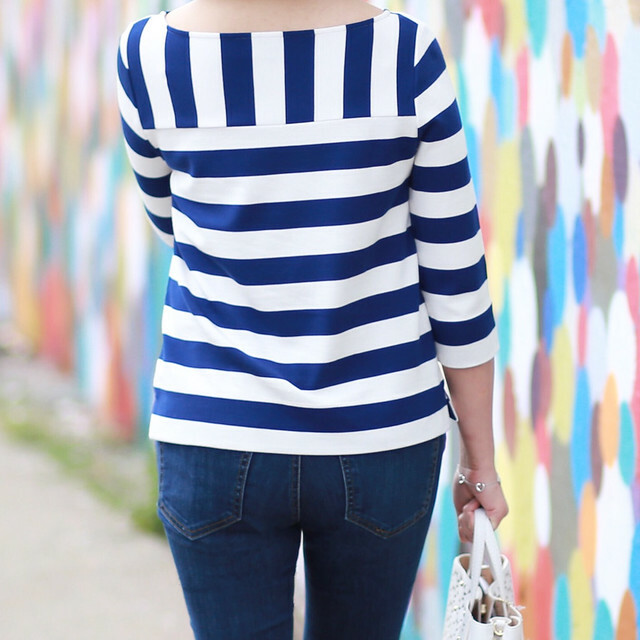 If you love pleated tops definitely give this a try to see if it flatters your body type. 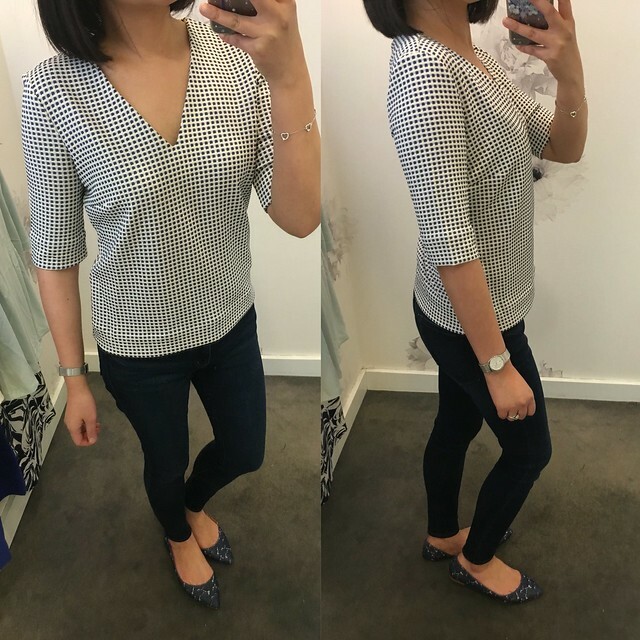 I saw this structured gingham top on the lovely Patty and I had to give it a try. Size XS regular fit me everywhere except the v-neck was too low and loose since I have a smaller bust although it’s hard to tell that from the above pictures. The fit is on the short and boxy side so I purposely tried it on in the regular missy size for the extra overall length. I found that it runs true to size. 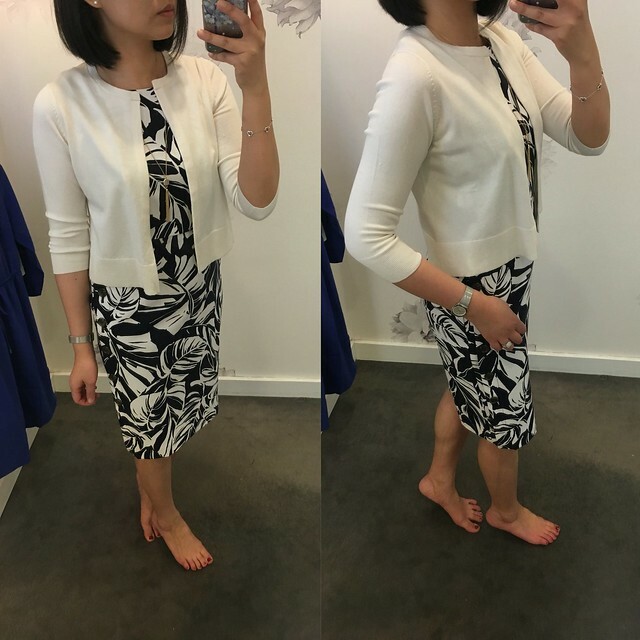 This silk cotton cropped cardigan is a nice layering option over spring and summer dresses.Size XS regular fit me perfectly but I prefer a more cropped length so I would probably get this in petites. Open cardigans are also so easy to throw on over sleeveless tops to stay warm against the A/C that’s usually blasting indoors this time of year. There’s also plenty of neutral colors to choose from. The palm print on this shadow floral side button dress is gorgeous and I loved the buttons on the side. 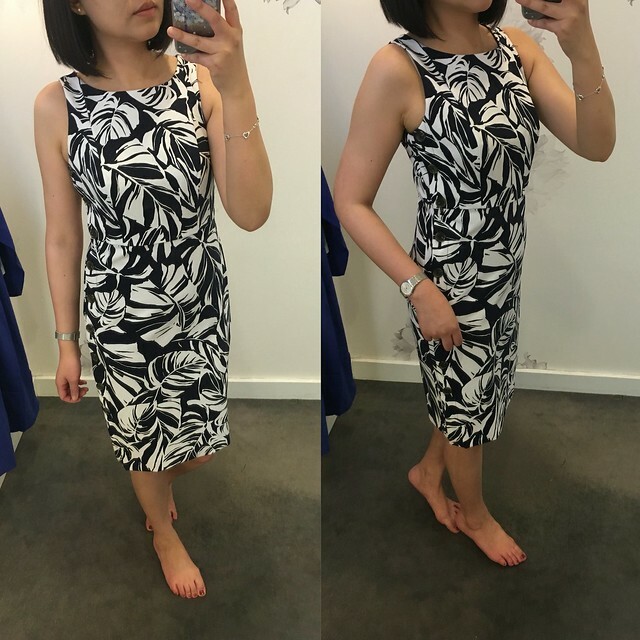 I tried on size 0P and the empire waist was big (around 31″) and the arm holes were a bit generous. I personally found that this dress runs at least one size bigger than my usual Ann Taylor size so I would recommend going down one size unless you have a larger bust. Banana Republic – Get 40% off your purchase with code BRTAKE40. Valid in stores and online. Exclusions apply. Sale ends 5/30 11:59PM ET. My favorite Gracie espadrilles (review here, last seen here) are included in this sale. J.Crew – Get 30% off select full-price items and an extra 40% off sale styles with the code WEEKEND. Today only (5/30) get FREE shipping on all orders. Valid in stores and online. Valid online on full-price items marked “30% off with code WEEKEND” and on sale items marked “Extra 30% off with code WEEKEND.” Sale ends 5/31 at 11:59PM ET. My favorite Gemma leopard flats (review here, last seen here) are on sale. I received a $50 rewards card in the mail so I also stopped by J.Crew today and this sundress in ratti happy cat print caught my eye. I only grabbed size 00 regular to try and it was too snug since the empire waist is 26″. 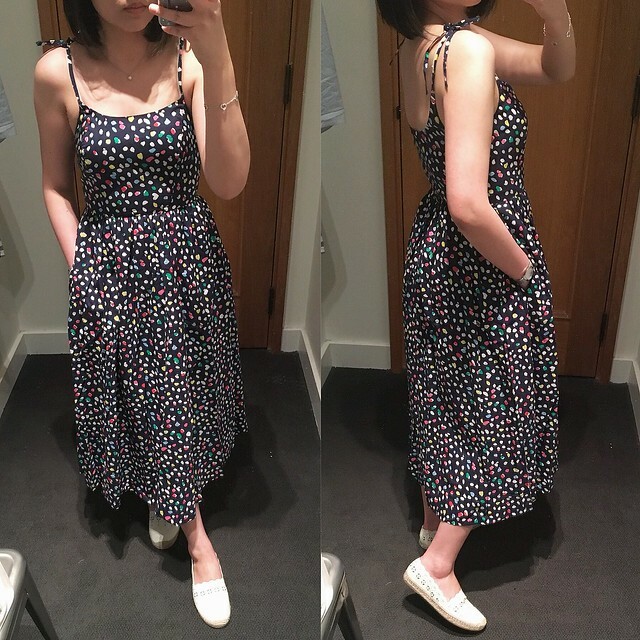 The length works as a midi dress if you’re around my height (5′ 2 1/2″). I just love the bow tie straps and the fact that it has pockets. I was too lazy to try it in another size but I may go back another day to reassess the fit in 0 regular or just order it in petites. I probably need this dress in 0 regular or 2 petite and I ordered 2 petite for now so I hope it fits. The Limited – Get 50% off almost everything and an extra 60% off select styles. Valid in stores and online. Online prices reflect discount. My favorite asymmetrical drape front cardigan (review here, last seen here) is included in this sale. Nordstrom‘s half yearly sale is going on strong. Save up to 40% off select styles. This sale is valid in stores and online and valid through 6/5. Personally this sale gives me a lot of anxiety because I could spend hours looking through all the sale items for fear of missing out on a good deal. This Longchamp Honore wallet on a chain caught my eye as well as these Loeffler Randall Mara espadrilles although these Sole Society Elodie flats look like the similar for much less.